My buddy Gary Thomas (a.k.a. "Muskrat") asked that I talk about the use of borax as a gold amalgamation and smelting agent. I suspect very few small-scale miners are aware of this use for borax so Gary's suggestion is a good one.Want to learn more? Read on then. I've spoken on occasion about the dangers of mercury as an amalgamating agent for gold. Once again I want to stress to you mercury is NOT something you want to be using to amalgamate fine gold. It's dangers are well known and its detrimental effects are long lasting both environmentally and from a health physics standpoint. You all know that I place a great deal of faith in the old timers and their prospecting and mining methods, but their use of mercury in the past is...well...nothing short of appalling. Most of those old salts were unaware of mercury's dangers so in this case ignorance could be the plea bargain. After all, they were going for every bit of gold they could recover as should you. It's just that their method in this context was just plain wrong...not from an efficiency context but for the reasons I've already mentioned. Despite all this, mercury continues to be used extensively in small-scale and commercial enterprises in many Third World countries, including some located in Africa, Asia, and Central and South America. However, there is a non-toxic agent that works just as well for binding small particles of gold and enhancing the gold smelting process. That humble servant is borax. Yep, the same borax that goes into Boraxo soap and that used a 20-mule team to commercialize its presence on television back in the 1950s and early 1960s. Experts say the borax method of amalgamation/smelting is actually more efficient than using mercury. This caused me to raise my eyebrows a bit when I first read it, but as I researched this issue at greater length this claim came up time and time again, so there has to be something to it. There's no doubt using borax as an amalgamating agent is much, much safer than using mercury and here's the real kicker...it's a hell of a lot cheaper too! The miners' moss from small-scale mining equipment (sluice box, dredge, highbanker, etc.) is placed in a bucket or tub of water containing borax. Just how much borax to use is open to debate, but suffice it to say the water and borax mixture should have the same appearance as whole milk when it's poured into a glass. In other words, milky white. The miner's moss or matting is then washed in the bucket or tub just as you would normally do it to free the gold and heavies. As far as the borax is concerned, the best type to use is commercial grade which comes in sealed packages ranging from a few pounds (usually five) on up to 50 pounds or more. 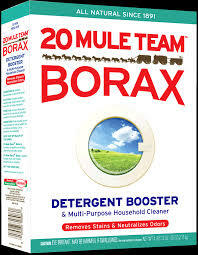 However, you can use good ol' 20-Mule Team Boraxo soap if push comes to shove. A five-pound bag of commercial borax costs around eight-to-10 dollars (USD) while a 50-pound quantity runs around 30 bucks. I don't know how much a five-pound box of Boraxo soap costs, but I hazard a guess it's probably three-to-five dollars...or somewhere in that range. 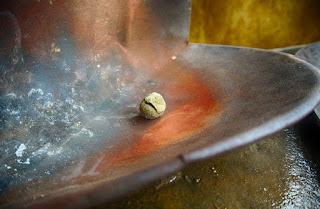 In Third World locales the concentrates are then run through a mini-sluice and reduced and "refined" (i.e., cleaned). The concentrate residue is then placed in a small plastic container (plastic sandwich bags seem to be the choice in the Third World) and a small amount of water and borax are added. Or, alternately, the concentrates are placed in a gold pan or batea and a bit of water and borax are added to the mix and the whole concoction is stirred around. 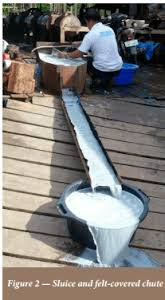 If you're using a spiral gold wheel or Blue Bowl concentrator to process your heavy concentrates or any piece of fine gold recovery gear that re-circulates water, make sure you have that "milky" color going for you. Again, that's the result of adding borax to the water. Third World miners then take the final result of their borax amalgamation process, let it dry out, and then place it in a clay or ceramic bowl where they apply a hand-held propane torch to it. Gold melts around 1,948 degrees Fahrenheit, but the addition of borax to concentrates actually lowers the gold melting point down some and helps refine impurities out. That's what the experts say, anyway. The end result? A small button of gold. I have no idea whatsoever of the chemical basis for borax as an amalgamation/refining method. I do know that soap helps in fine gold recovery from a suspension angle. I'm an educated and sometimes smart guy, but if you're interested in how borax works its magic you're on your own. A bit of research on your part should explain all and then you can educate the rest of us! What can be said here is that borax is a hell of a lot cheaper than mercury and essentially safe as far as people and the environment are concerned. Anyhoo, I hope I've answered "Muskrat's" basic question about borax in fine gold recovery and additionally your own. JR, WOW! Now that is interesting! Something I will try for sure. I had a friend that was a blacksmith. He used borax as a kind of flux when hammer welding two pieces of steel together. No idea why it was needed, but he said without it, you could not get a good weld. Hammer welding, you are just pounding two red hot pieces of metal together until they become one. I would bet this is somewhat similar. The borax maybe removes whatever is on the metal that keeps it from bonding? I don't know, but I'll sure as Hell give it a try! THANKS! outside in the open, cut a potato or a jicama in two , scoop out a decent cavity, pour some borax in , pour in your blacksand cons, cover with borax, heat with MAPP gas till a button is glowing. turn of gas pick up the crucible of Jicama , ye, by your fingers is ok and tip it in a bucket of water, then claim your button... I did find that Mapp gas took 10 plus minutes but oxy aceteline was quicker... I suppose that is too slow and for larger amounts you may need a bigger potato..... well ,how big do they grow?? I have heard of using a potato with Mercury....even tried it, but not with borax. With Mercury, you are burning off the Mercury into very dangerous fumes, so a good breeze and standing upwind, outside is the only way to even consider doing this. For the slight amount of gold I was able to recover, it was not worth the danger. The biggest reason I tried it, was because I was finding gold that already had Mercury on it, and I needed to get it off somehow. Is there a safe way to clean Mercury coated gold without burning it off? I read something about nitric acid, but I have no idea where to get that, or if it is any safer. 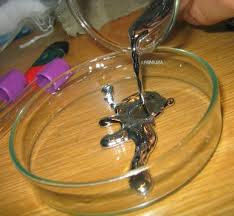 If you have gold-coated with mercury get a ceramic bowl and place the gold in it and drop a few drops of nitric acid onto it. DO THIS OUTDOORS (the fumes are dangerous...even when working in a small way). Wear rubber or chem gloves and safety glasses as added precautions. I used to burn the mercury off of placer gold this way back in my dredging days. Yep, the old timers used the potato routine with mercury as well. Here is my 2 cents worth. Borax is used in the smelting process just like a chapman or other fluxes. It doesn't produce an amalgam since it doesn't have an infinity to gold like Mercury does. If your trying to get a little gold out of your blacksands Mercury or other gravity devices like the gold lab, blue bowl, Miller table, etc....are your choices. But if you have 80+% of gold to blacksand then borax or other fluxes will work just fine. On my claim, in central Idaho, most of my gold is -30 mesh so getting clean gold that I can smelt is a real challenge. I use the gold lab with excellent results but like a simple blue bowl or Miller table it does take time to process but works best on -30 mesh. If anyone has an idea on how I can crush my -12/+30 mesh so I can run it please let me know or if anyone has experience in leaching that also would be helpful. Thanks for your info Bob. It helps illuminate something I know little of. Can anyone out there help answer Bob's query?